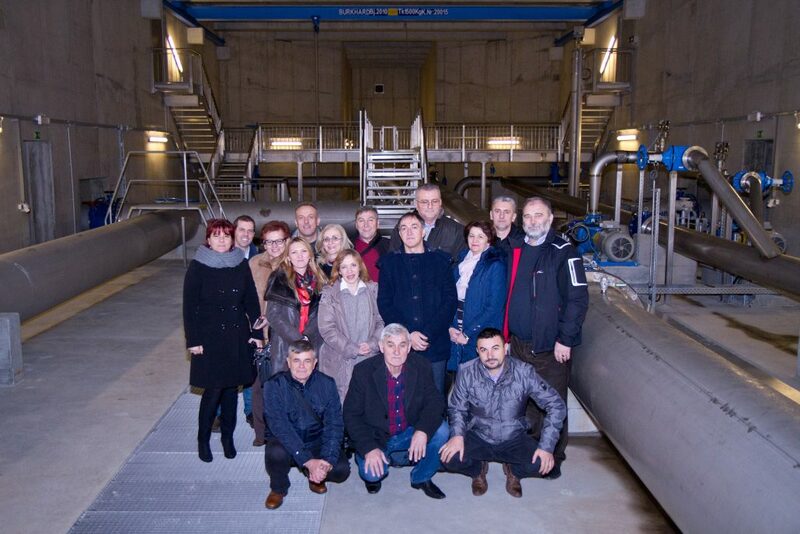 From 13 - 15 December 2016 a delegation of representatives from the Public Utility Company „Waterworks and Sewerage“ Ltd. Zenica visited Vienna Water to exchange experience in waterworks management. The visit focused on exchange on the following topics: Customer relationship, selection of materials for pipelines, technologies for reconstruction and construction of pipelines, procedures for calibration and replacement of water meters, the experience of transition from common water meters to individual water meters in buildings, and types of water meters used at Vienna Water. The delegation was presented and discussed information about the Danube Water Program and the possibilities and benefits of becoming member of IAWD. After a morning of discussions and exchanges the first day was completed with a tour through two „watermarks“ of Vienna: Vienna Water Tower and the Wienerberg Reservoir. On the second day the delegation visited the Museum of Vienna Water at the source of water supply in Kaiserbrunn. The delegation was provided with information on the history and construction of the First Vienna Spring Water Main and of Vienna´s drinking water supply from 1869 to the present. The three day study trip concluded with a visit to Vienna Water where the delegation learned about the wastewater treatment system of Vienna modelled on nature. Within the framework of the international programme of the UN-Habitat agency through the Global Water Operator´s Partnerships Alliance (GWOPA), as another milestone of the Hungarian-Serb water cooperation, on December 9 2016 Subotica Waterworks and the Sewage Water Utility organised a one-day workshop at the City Hall of Subotica for Serbian and Hungarian professionals. At the meeting the host presented the results achieved in the fields of technical and technological development,water extraction and drinking water technology, quality assurance and environment protection realized within the frameworkof Interegrated Management System, work safety, monitoring as well as the results achieved in the field of water treatment activities. The professionals from Budapest from among the cooperation areas of the water utility services spelles out as such important questions, like the SAP-based integrated management system, the work management sysem in the water utility sector, the centralized operational management, reduction methods of the non-revenue water and the technical tools of the water loss analysis. On 1 December 2016 a delegation of senior representatives from water utilities in the Republic of Srpska visited Vienna Water and IAWD. The visit was part of a study tour organised by the Water Utility Association of the Republic of Srpska to Switzerland and Austria. The aim of this visit was to support managers in utilities to learn about management practices in other utilities. In addition to discussion on Vienna water management the utilities were also informed on the possibilities and benefits of becoming member of IAWD. After a morning filled with presentations and information about Vienna Water and IAWD the technical visit was completed with a tour through two „watermarks“ of Vienna: Vienna Water Tower and the Wienerberg Reservoir. In the representation of nearly 120 countries, about 2000 scientists, politicians and experts consulted on today’s perhaps most pressing issue, one of the key element of the environmental sustainability, the protection of our water and water resources during the three days of Budapest Water Summit. The Roundtable of Water Utility Associations convened in Vienna on 27-28 October 2016. The focus of the meeting was the final establishment of the Danube Learning Partnership (D-LeaP). Ten representatives of water utility associations as well as the team of the Danube Water Program, and GIZ, reviewed the final drafts of the D-LeaP Governance Documents, included comments and proposed final changes. Furthermore, the state of D-LeaP offerings was presented and potential hubs declared their interest in one or more of the offerings. The Technical Partners for the Commercial Efficiency (Valu Add) and Energy Efficiency (Econoler) programs have been selected following the meeting and the development of the curriculum of these topics has begun. IAWD has played a central role over the past two years in bringing Water Utility Associations from the Danube region together to discuss topics of common interest. 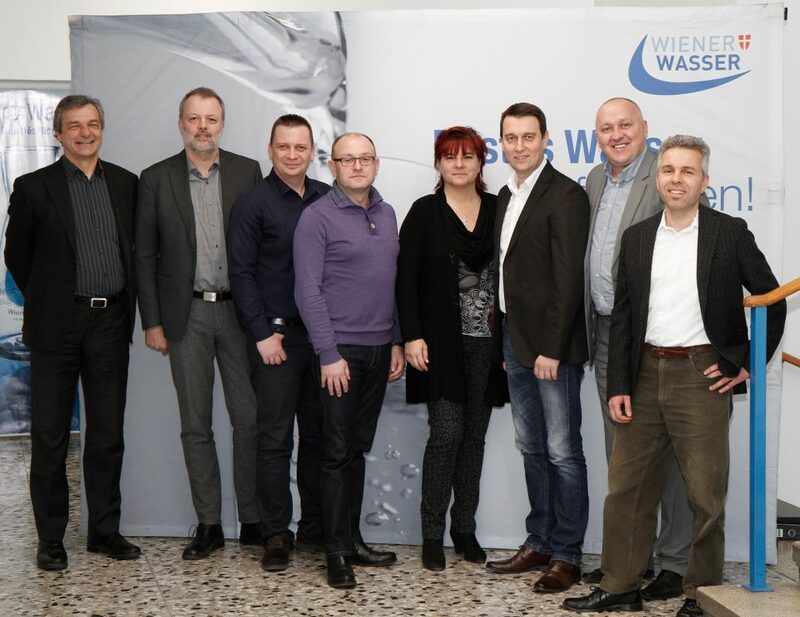 The most recent meeting of this "Roundtable of Water Utility Associations" took place in Vienna on October 27-28, 2016. 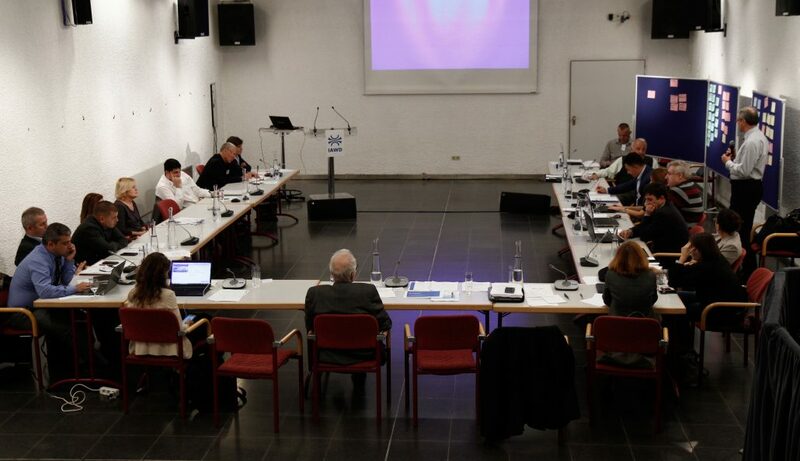 The focus of the meeting was the establishment of the Danube Learning Partnership (D-LeaP) which the Roundtable of Associations has been promoting since its first meeting in September 2013. Ten representatives of water utility associations as well as the team of the Danube Water Program, and GIZ, reviewed the final drafts of the D-LeaP Governance Documents, and provide comments and final changes to the documents. IAWD is playing a central role in facilitating the formation of the Danube Learning Partnership and the meeting confirmed the commitment of the Associations to use cooperate with IAWD in this initiative. As an expression of commitment many of the Associations expressed their desire to join IAWD as Extraordinatry members. The first of these - OVGW and the Hungarian Utility Association MAVAZ have already done so with more expected shortly. On 25-26 September 2016, Ms. Eszter Torda, Program Manager of IAWD participated and gave a presentation on the Water Operators’ Partnership (WOP) and the strategic cooperation with UN-Habitat/GWOPA in the panel discussion on water at the annual conference of the Institute of the Regions of Europe in Salzburg. The panel discussion was moderated by Mr. Hasenleithner from Energie AG Oberösterreich Wasser GmbH who recently joined IAWD. Ms. Eszter Torda underlined, that UN is committed through UN-Habitat Programme to an integrated urban water management as it has a direct impact on urban ecology, economy, resilience and equity. With the idea of twinning water operators that have expertise to share with those who would benefit from that expertise, WOPs constitute a win-win solution for capacity development worldwide. Ms. Eszter Torda stressed, the Danube river is an international highway between major urban areas of Europe with essential economic and human resource opportunities for business, innovation and technological challenges. The concept of the strategic cooperation with UN recognizes and puts emphasis on these factors and the underlying possibilities. She recognized, that in this century water needs to be at the heart of the conversation. IAWD Secretary General, Walter Kling, also participated in the event, using the opportunity to promote future cooperation with IRE on water related topics focusing on the Danube Region. There were approximately 200 participants at the conference. It was a great opportunity to promote the work from Austria and South-Eastern Europe-wide, on local government level. 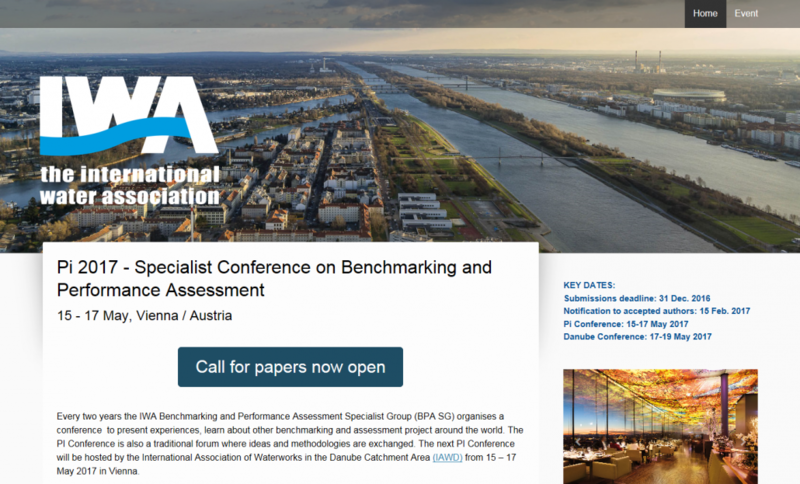 Every two years the IWA Benchmarking and Performance Assessment Specialist Group (BPA SG) organises a conference to present experiences, learn about other benchmarking and assessment project around the world. The PI Conference is also a traditional forum where ideas and methodologies are exchanged. The next PI Conference will be hosted by the International Association of Waterworks in the Danube Catchment Area (IAWD) from 15 – 17 May 2017 in Vienna. For further information visit the official conference webpage. At the General Assembly in May IAWD welcomed three new members to the organisation: Compania Apa Brasov SA and Apaserv Satu Mare in Romania and Vodovod Subotica in Serbia. Each of these utilities are active members of their national associations and have been active in improvements to their operation as well as engaged in international activities. In joining IAWD General Manager Danutiu Stegerean of Apaserv pledged “to contribute resources and expertise to the successful development of regional collaboration with other water companies in the Danube area”. Subotica has demonstrated its commitment to cooperation by agreeing to participate in a Water Operator Partnership together with long-time IAWD member Budapest Waterworks. Darius Bör from Apaserv Satu Mare said "IAWD serves as the dynamic knowledge hub for water utilities to establish their own foothold". In March 2016 a Memorandum of Understanding (MoU) was signed between IAWD and the United Nations Human Settlements Programme (UN-Habitat) through the Global Water Operator´s Partnerschips Alliance (GWOPA) to establish Water Operators’ Partnerships (WOPs) in the Danube region. The aim is to develop new opportunities for IAWD and its members, improve the service quality in the region with the support of UN. The first WOP was launched in April 2016 between Budapest Waterworks and the Waterworks of Subotica in Serbia - a new IAWD member. The established WOP has also given rise to mutual „fact-finding missions“ in each other´s operation and a number of workshops. Budapest has also provided manuals in Hungarian and English language. A WOP last for 14 months and can subsequently be extended. NALAS brings together 16 associations which represent roughly 9000 local authorities, directly elected by more than 80 million citizens of this region. NALAS promotes the process of decentralisation in cooperation with central governments and international organisations, considering local self-government as a key issue in the current process of transition affecting the various countries in the South-East Europe. During the XI NALAS (Network of Associations of Local Authorities of South-East Europe) General Assembly, held in Pristina on 14 and 15 April 2016, a Memorandum of Understanding (MoU) was signed between NALAS and IAWD. "I am happy that I was able to attend NALAS conference yesterday and learn about the challenges of local governments in the Region when it comes to investments. We are here to join actions, develop capacities and improve services to citizens", said Mr. Walter Kling on behalf of IAWD. "In the past several years, with the support of the GIZ Open Regional Funds - Modernisation of Municipal Services, NALAS has been working intensively to improve the conditions in the water and waste water sector, supporting municipalities to provide well managed, good quality and sustainable water services to their citizens. During this process, we have met a valuable partner, IAWD, and have started an exchange of knowledge and expertise, being aware that municipalities and their integral part, the public utilities, must work closely together in improving the services and planning investments. 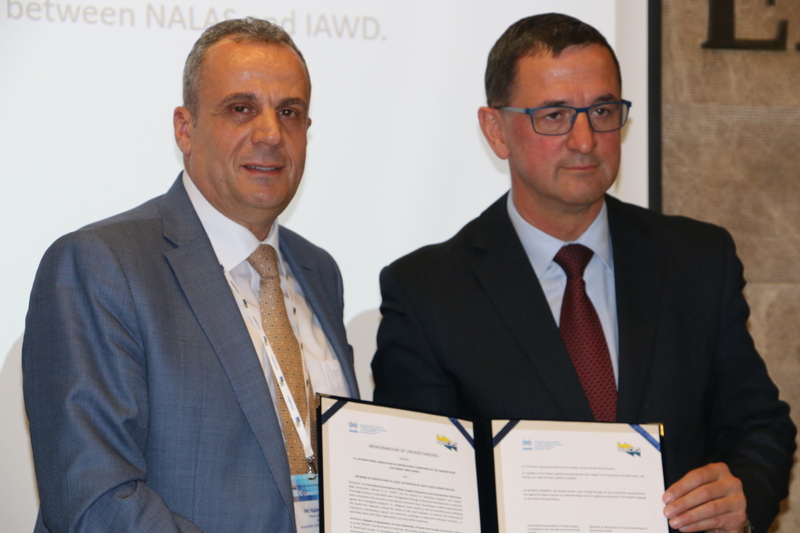 Today, by signing the MoU, we are bringing the existing cooperation with IAWD at a next level", said Mayor Naim Ismajli, the new NALAS President. Further information on NALAS can be found here. The development of this web site was supported by German and Swiss Cooperations through the Regional Dialogue Platform project, implemented by IAWD and GIZ Open Regional Fund for Modernization of Municipal Services.